While watching Matilda a few months ago, I suddenly realized I have never read the book. I always thought that I had. I love many Roald Dahl books (The Witches and The BFG are my favorites), but I hadn’t read this one. So I borrowed it from my parents and read it out loud to my husband. It was a perfect book to read out loud–shorter, plenty of fun voices to create, and some hilarious pictures to show. We loved the ridiculous things people say (especially Ms. Trunchbell) and the great pictures depicting the antics of Mr. Wormwood and Ms. Trunchbell especially. Of course, I love Matilda as a fellow book worm. She is more well read at age 5 than I probably am now. I love that she loves the classics and that she spends all her afternoons in the library before she’s old enough to go to school. I still would love to spend all my afternoons in the library just browsing and reading. It impressed me how grown up and yet childlike Matilda is in the book. I was impressed by how sweet and how good Matilda is depicted. Matilda is likable because she isn’t arrogant about how smart she is. In fact, she doesn’t seem to know that she is out of the ordinary smart. While she is very book smart, Matilda is still a child. She doesn’t have the experience or “street smarts” that older people have. I like that. I like that she is still innocent despite her obvious skills in the classroom. Her ability to move objects with her mind comes because she is not pushing her mind in the classroom. But as soon as she is moved up to the higher class at the end of the book, she loses the ability. I like Miss Honey’s theory that because Matilda is working her mind in other ways, she loses her telekinesis. That makes the story all the more believable for me. While she can do complex math in her head and loves reading Charles Dickens, Matilda is also a child who wants to help her friends and avoid being put in the infamous “chokie” by Headmistress Trunchbell. While we are on that subject, let’s talk briefly about dear Headmistress Trunchbell. If you thought she was nutty in the movie, I think she might be more crazy in the book. She says the most ridiculous things, calls children the most outrageous names, and throws children all over the place. She had us cracking up almost every page. I was surprised to recognize so many lines and scenes from the movie. We have Lavender putting the newt in Ms Trunchbell’s pitcher of water and the Trunchbell forcing a boy to eat an entire chocolate cake. In fact, the movie stays very true to the book, with a little dramatic elaboration like when Miss Honey and Matilda almost get caught in the Trunchbell’s house and signing adoption papers at the end of the movie. I would have liked to see more of the pranks Matilda pulls on her family like the parrot in the chimney. But I appreciated that the movie doesn’t put Miss Honey in quite as dire circumstances as the book does (really, no furniture or running water is pretty intense). Ultimately, this is a story of friendship and loyalty, of a love of literature and a love of life, of finding happiness no matter your circumstances. It’s a great book to read out loud and a fun story to follow. And apparently there’s a Matilda musical now. I will have to check it out. 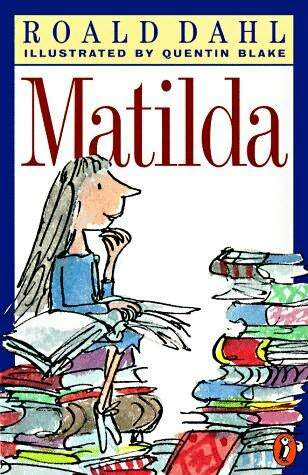 Roald Dahl books are so great because I still enjoy them years after, Matilda is one of my favourites so I am glad you loved it!